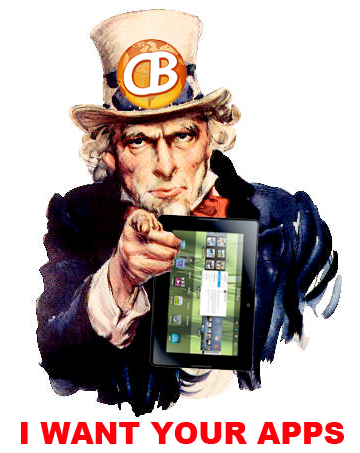 Calling All Developers... We Want to Know About your Upcoming BlackBerry PlayBook and Smartphone Apps! As you might imagine, all of us writing for CrackBerry.com are really excited about the upcoming release of the BlackBerry PlayBook. With it being an entirely new device built on a different operating system that will usher in a new era of BlackBerry apps and games, us bloggers are going to have a lot to talk about. And in our ongoing mission to be the ultimate online source for all things BlackBerry, we want your help to make sure we don't miss a thing. If you or your company is working on a new app for the BlackBerry PlayBook (BlackBerry Smartphone app news is of course always welcome too), we want you to tell us about it so we can tell CrackBerry Nation about it! Just submit your app to App World and want to announce it here first on CrackBerry? We can totally do that. Need to find some beta testers? We can help arrange that (heck, we can give you your own company forum in our crackberry forums!). Working on an awesome app and want to whet the BlackBerry world's appetite? You can send us some teaser screen caps. Maybe you have another idea? Tell us! You know what were saying here... Help Us Help You! To submit your BlackBerry app news to us, all you need to do is send an email to apps @ crackberry.com. Be sure to include any screen caps, video links, or anything else that'll help us help you spread the word. Let the BlackBerry app craziness begin!